The library is the heart of any school, and the person who was responsible for laying the foundation of Dana Hall’s library collection was Dorothy Currier, a librarian at Dana Hall for 23 years. She was born in Newburyport, MA, and her grandfather, Andrew F. Ross, was a well-known tea and spice merchant in Newburyport in the late nineteenth century. His business was located in Hope Mills, a major United States entry point for the importation of tea and spices. Miss Currier graduated from Dana in 1921. She was a member of Tau Kappa Delta, the honor society at Dana. 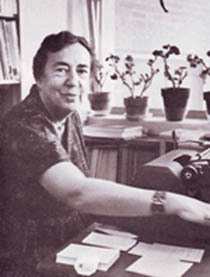 Before joining the Dana faculty in 1947, she worked as a public librarian at the Morse Institute Library in Natick and at the Wellesley Free Library. At Dana Miss Currier worked in the Eastman Library, a jewel of a room located in Dana Main. A gift of the Class of 1905, it reflected the elegance of the period with sculpted busts, carved medallions, a beautiful oval stained glass skylight, and Tiffany lamps. Miss Currier had the task of moving the library twice! The first time was in 1956, when the Eastman Library moved down Grove Street into the new classroom building, and the second was in 1965 to the new Helen Temple Cooke Library located in what is now the Middle School. In addition to loving books, Miss Currier was an avid horsewoman and hiker. She rode over some of the most difficult trails in the Rocky Mountains and climbed extensively in the European Alps. Miss Currier was extremely devoted to Dana. She attended almost every reunion and was her class agent from 1932 to 1981 and Dana Hall Alumnae Secretary from 1948 to 1954. She was close to many of Dana’s headmistresses, as she was a student at Tenacre and Dana under Helen Temple Cooke and a librarian under Alnah Johnston and Edie Phelps. In 1981 Miss Currier was awarded the Dana Hall School Distinguished Alumna Award for her long and devoted career in the service of Dana and because she enriched the entire Dana Hall community. “Alumnae Honored at Annual Meeting.” Dana Hall Bulletin. June 1981: 12. Currier, Dorothy ’21. “The Center.” Dana Hall Bulletin. June 1965: 14-16. “Dorothy Currier.” The Wellesley Townsman, Obituaries. 30 March 1995: 14.